Note: Prior to studying abroad in London, I spent 10 days in Ireland and Northern Ireland as part of the prequel class “The Pale and Beyond.” We spent five days in Dublin and then five days in Belfast learning about Irish culture and identity. For more about my time in Ireland, check the Ireland category tag on the right. Like in Dublin, we had our last full day in Belfast mostly free to explore the city and surrounding area. But first, we all met in the hotel lobby to walk over to St. George’s Market. The market takes place inside this huge warehouse-type facility and has tons of vendors selling everything from fresh produce and cupcakes to jewelry and paintings. It was a great place to buy gifts and also grab a quick bite to eat. After we left the market, we all had about five hours to spend in Belfast before our final group dinner. Some members of the group walked uptown to visit the botanical gardens and others visited the Titanic museum. I walked around Belfast with a few people and did some shopping before returning to the hotel to relax. We all met up again that night for our final group dinner at the Crown Pub. The Crown has some very cool stain glass decorations and a lot of polished wood inside. It also has these old fashion areas called snugs. Snugs usually fit about six or seven people in them and are basically big booths with doors you can close so you can drink and eat more privately with your group of friends. But our dinner took place upstairs in one of the bigger private party rooms. We all enjoyed the food and getting the chance to talk with each other. The next day we loaded all our luggage into the coach for our ride to the Belfast airport. 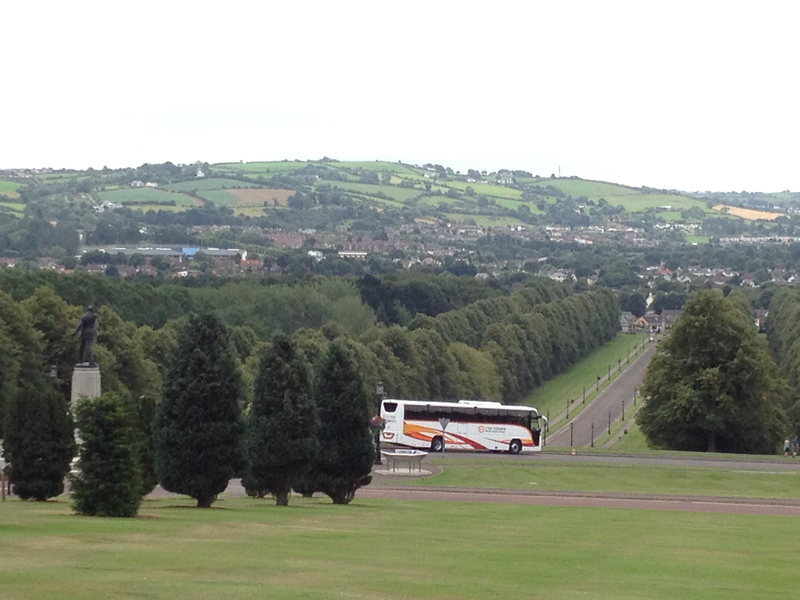 On the way to the airport, we stopped at Stormont Castle, the seat of the Northern Ireland parliament. It’s a beautiful old stone building located about 5 miles outside Belfast. 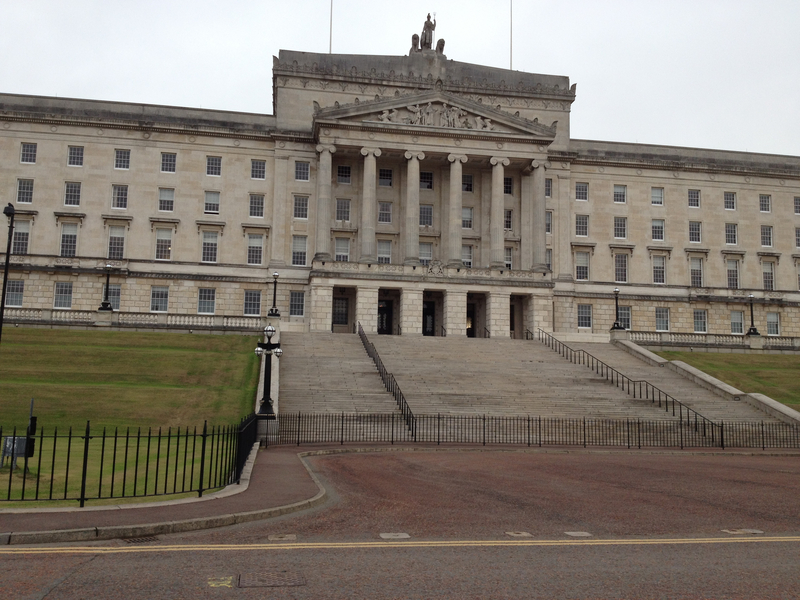 The parliament wasn’t in session though, so we just took a few photos before getting back on the bus. We got our baggage checked and made it to our flight without incident. After a short 1-hour flight, we arrived in London’s Heathrow airport. We had been at Heathrow just ten days before on our way to Dublin, but it felt like months ago. After collecting our luggage, we got on the coach for one last ride into central London. We had one night before the other study abroad students arrived and, though I was sad the trip was over, I was also happy that I would be able to see so many familiar faces as I began my semester studying abroad in London. This entry was posted in Ireland and tagged Belfast, Ireland by Jessica Iannetta. Bookmark the permalink.